I use Yahoo alot, as in I use Yahoo for business and personal most hours that I am awake. Which is why I am surprised that I didn’t notice all of the small little changes they have been making. After taking a step back and giving the Yahoo SERPs a fresh look I noticed there are alot of changes. Yahoo removed the links to the Yahoo Directory. So if your site is in the Yahoo Directory, users will no longer see a link to your category under your site snippet. Yahoo also added a “near you” local feature. 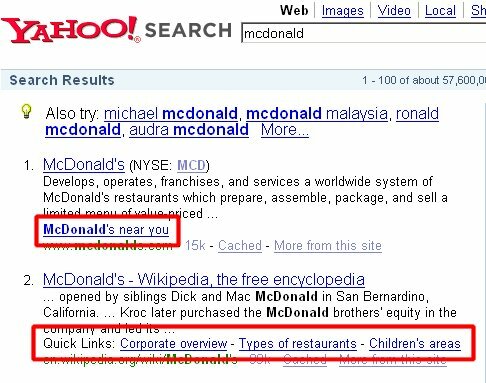 Now when you search for McDonalds you can click on “near you” and use Yahoo Local to find one. They also added quick links to key pages on a site. So for all of the bigger websites out there users can skip a few clicks and get right to the where they want to be. Personally I think these changes are mostly good. Of course I am one of the few die hard directory fans out there and I wish they allowed me to personalize the serps and add back in that link. Often when I am searching for a hard item, it is helpful to find a site in Yahoo’s search engine that is a near miss and then check out the related sites that are in the same Yahoo directory category. FYI These changes did not happen just today. They just slowly sneaked up on me and I didn’t realize it. Now I am blushing with embarrassment for not being more observant and rethinking if I am up for my next poker tournament. If Yahoo can make multiple changes without me waking up what hope is there for my poker game?